The Ampthill Nutrition Kitchen aims to increase your health through use of good quality produce, healthy cooking methods and nutritionally balanced recipes. Their subscription based website means you can have 1,2 3 ,4 or 5 beautiful and healthy lunches created for you each week - beautiful food, zero stress. Our recent brief was to create a website that showcases the amazing food produced at The Ampthill Nutrition Kitchen whilst providing information about the company, the food they create and a flexible ordering system which covers all buying options with a streamlined user experience. 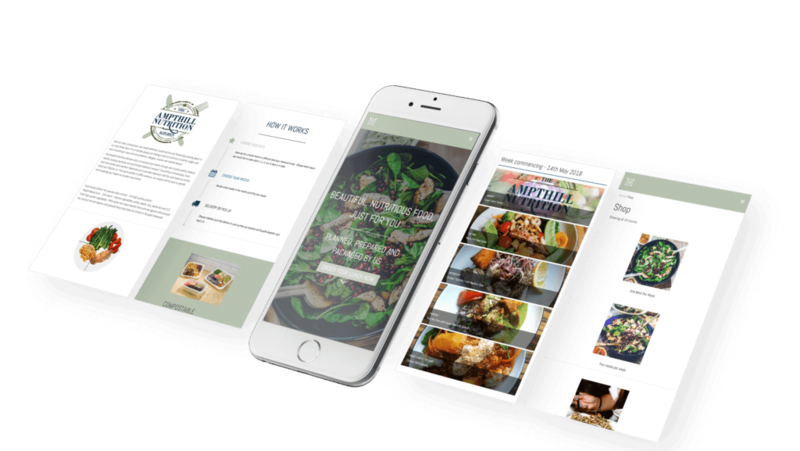 Our solution, built on WordPress backend, makes it easy for The Ampthill Nutrition Kitchen to manage adding recipes, imagery and content themselves. We developed a custom theme, built around our design concept, building custom modules for WooCommerce to add shop functionality and a smart customer experience. The outcome is a website built on industry leading solutions, with a unique visual appearance that can be managed by our client to deliver beautiful food to the residents of Bedfordshire. © 2016 - 2019 Fatz n Skillz Ltd, registered in UK, company no. 9681137. VAT Registration No. 217636406. All rights reserved. Don't steal, it isn't nice!